The moment I saw the lime pickle from here, I was bowled by its simplicity. The only worry was cooking in the sun. Though Singapore is a tropical country, it is very humid. Because of the humidity, our clothes catches fungus easily. We have to keep dehumidifier in all the wardrobes. So was very skeptical to prepare them but my internal gut feeling insisted me to try them atleast once with a small amount. I tried a small amount with lemons first(original calls for lime). Though lemons have a thicker outer skin, it becomes soft faster than the limes. Limes have thin outer skin but takes a hell lot of time to become soft. I followed the recipe completely & replaced lemons in place of lime. I didnot even place it in hot sun. I kept it near the kitchen window whole day. The pickle was completely done in 20 days & voila....it was a superhit. .
Wash the lime, green chillies, ginger & pat them dry. Chop the green chillies & lime as shown below. Finely chop the ginger or grate them. Dry roast the mustard seeds & fenugreek seeds seperately. Allow it to cool & powder them. Take a sterilized glass jar(ensure no moisture inside the jar). Add 1/2 of the chopped lime pieces, green chilli, ginger. Add 1/2 cup salt, 1/2 cup sugar, 1 tbsp turmeric, half of the mustard + fenugreek powder. Now add the remaining lime pieces, green chilli, ginger & the remaining salt, sugar, turmeric, mustard + fenugreek powder. Pour in the lemon juice & close the lid. Shake the bottle well & keep it in your balcony. Keep shaking the bottle every alternate day & mix them thoroughly using a spatula once in fortnight. The outer skin slowly changes its color from green to yellow & becomes soft.Sugar takes control over the bitter taste of lime. Juices tend to become thick as days & weeks pass by. Ensure there is no moisture on the inside of the lid, jar or spatuala used. Keep your palms dry. Use a clean spoon to scoop out the pickle. Just pinch a small portion of lime. Lime gets easily torn if it is completely soft & cooked. Also, the juices would have become thick. Once the pickle reaches this stage, you can store them in refrigirator. This pickle doesnot become sweet. After 10-15 days, if you feel salt, sugar or chilli is less, feel free to add them & mix them thoroughly. However, dont try to add chilli after the lime is almost soft & cooked. I will update this post on how long the pickle lasted for me. Oh wow thats really mouthwatering and yummy .. I love lemon pickle seeing urs really drooling..
R u in singapore. My sister just moved there a couple of weeks ago. The pickles looks absolutely beautiful :) so mellowed and perfect. I wish grab some right off..
ahha..perfect one! Swalpa mosaranna idra jote..slurrp! 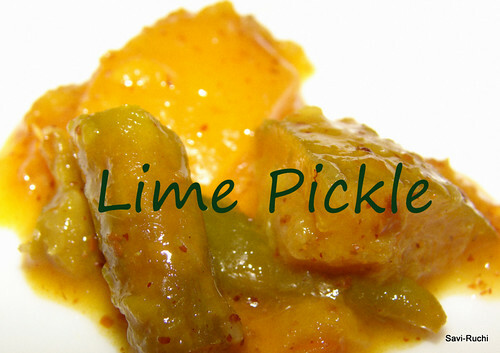 I make this pickle regularly at home with lemon peels and lemon mixture. Totally oil free pickle! I had bookmarked this recipe, but never got to doing it. I will try this over the weekend. 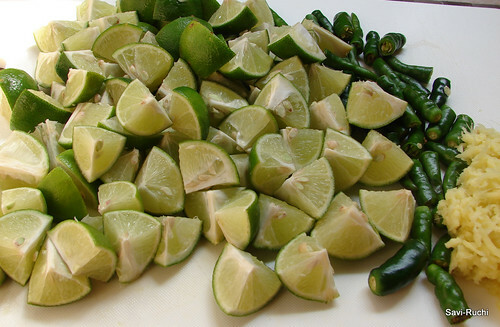 Like you said I might use only 5 limes. I have to finish it before winter sets in. Along with my mood the pickle also will get fungus in the winter blegh. Thanks for your comments. Will put up my mom-in-law's version of rasam soon. Lemon would take much lesser time to soften, right? I have tried with lemons once, it was done in 10-15 days. Thanks your the comments. This looks just out of the world, bookmarked! Thanks for dropping by my blog and helping me discover yours. Lovely recipes here. Oh my that looks sooo mouth watering! My tongue tickles seeing the lime pickle, nice clicks!